Hello! It's time for a new Mojo Monday sketch (#181).. It's also March contest week.. I hope you will join us for a chance to win some Verve stamps! I had a lot of fun with this week's sketch and my card came together fairly quickly (that doesn't always happen.. :)). 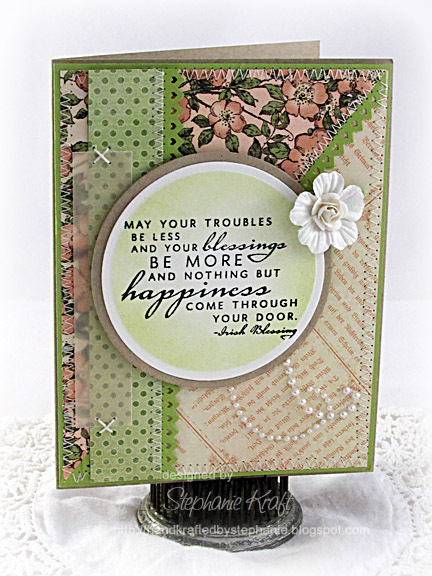 I used an Irish Blessing from Verve's Blessings, which happens to be the March 2011 stamp of the month. If you don't already have this lovely set, now is your chance to get it at 30% off! Accessories: Standard Circle Nestabilities (Spellbinders), Arrow Border punch (EK Success), Flower (Prima), Pearl flourish, Crochet cotton, Foam tape, Thread, Sewing machine. Such a pretty card Stephanie! Love the stitched on vellum and the soft BG behind the sentiment! Looks like a fun sketch to play with! Thanks for the inspiration! such a pretty card Stephanie, love the sketch...love the papers...Great! *gasp* This is so beautiful Stephanie!!! Very nice, love the papers. This is STUNNING, Stephanie! I love the papers and embellishments you chose for this unusual sketch; really perfect! AMEN!!!! To THAT blessing and your fantastic card! It is some TRULY breathtaking craftiness! Yipeeee! Soft and serene and perfect papers to go with your beautiful sentiment. I thought the sketch was a tough one and you put it together beautifully. Out of this world totally memorable crafting. Keep Looking UP!